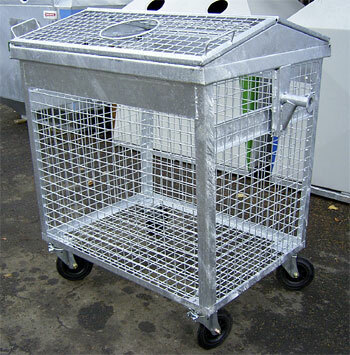 A receptacle for recycled waste collection with an additional protection ( a lock opened with a special key) which makes unable moving a flap by an undesirable person. 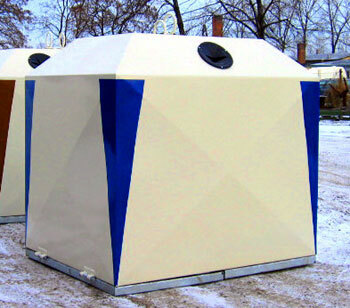 An aesthetically made and light receptacle can serve for recycled waste collection such as plastic. The handles placed on its two opposite sides make it possible to discharge a receptacle using a standard equipment for 1,1 m3 receptacles. The wheels of a diameter of 200 mm allow for easy moving. There is a possibility of the pedal breaks fixing and making a protection against an accidental opening of a top cover of a receptacle. 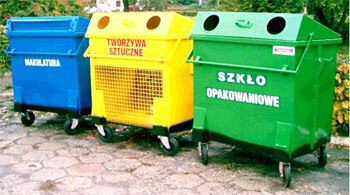 A receptecle for recycled waste collecting with the throwing holes of an appropriate size placed on 2 of its sidewalls. A receptacle for paper with an inclinable flap while the glass and plastic receptacles have the circle throwing holes. Other data depended on a type A receptacle for recycled waste collecting with the throwing holes of an appropriate size placed on 2 of its sidewalls. A container for paper with an inclinable flap while the glass and plastic containers have the circle throwing holes. Corrosion protection A receptacle spray painted twice inside and outside with an undercoat paint. 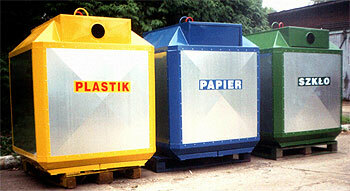 External sidewalls covered with the AGROHEL enamel in colours according to the recycled waste kind. Sidewalls made of zinc coated plate of 1,5mm of thickness which creates a positive visual effect together with painted corners. Other data depended on a type Discharging flaps which create a bottom made of a flame zinc coated plate. Metal rope, supporting the plates, made of steel line of 8 mm of thickness. The plates’ connection- continuous welding.